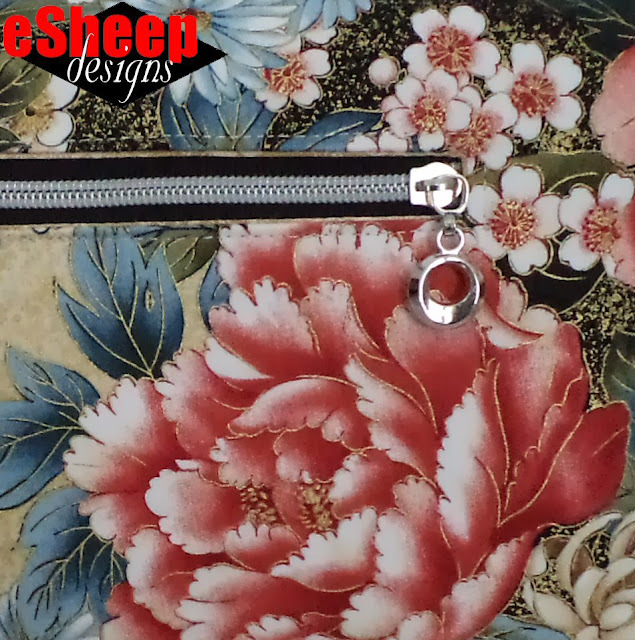 Can you help test my new pattern, the Diva Envelope Clutch...? A dozen or so years ago, there was a TV show based in Canada called Diva on a Dime. The premise was for the two hosts to take an "inspiration look" (i.e., a designer outfit) and replicate it using everyday options that didn't cost thousands of dollars. Their solutions sometimes involved tailoring similar pieces, but most times, it was a matter of knowing where to look and how to find it. Sometimes there's no explaining why, but I was instantly drawn to it... and wanted to make one myself. (Interestingly enough, it's not even expensive to buy. Prices vary, but I've seen one eBay seller offering it for $6.87 US with free shipping.) It's made out of vinyl, but as soon as I saw it, I knew I had the perfect fabric for recreating it: one of my Robert Kaufman far east selections, Oriental Traditions 14207-91 Floral Multi. The pattern is quite large and totally suited for something like this. While obviously not a difficult project to sew, it wasn't a totally intuitive pattern to figure out. I wanted this to be used as a portfolio — for paperwork, file folders, manila envelopes, etc. — so a typical (and easy to execute) loose lining that could potentially pull itself out every time something was removed was not the way to go. The inspiration version is loaded up with rivets all around and closes with a magnetic snap. Last February, I snagged a set of ten tuck/push lock closures that were being offered at an unreal price: $4.96 US. (I've recently seen similar quantities being sold for $36!) Not being a fanatical purse maker, they were still sitting around unused, so wasn't this just the perfect opportunity to showcase one of them? Not being big on "biker-esque" application of rivets, my version of the project is decorated with small grommets instead. These had been purchased for a past project, but were totally the wrong size, so it's great that they can finally be put to use here. Black Friday ALERT! Get 3 Months of Creativebug access for only $1! Of course, the options are endless as to how one can personalize the decorative aspects of this, but I'll leave that up to all of you to decide. Unlike the inspiration version, the interior of this clutch is unadorned to allow for easy insertion and removal of contents. Of course, we all like pockets, so I did go with a fair sized zippered pocket on the back. For the first time, I used zipper tape (from a recently purchased 4 metre roll) and attached one of my zippiest zipper pulls to it. Another difference between the two is that my version actually looks like an envelope when you open it up; the inspiration version has a straight top edge under the flap. Not having put out a pattern for sale in awhile now, I'm happy to say that this one has been written up as my next release. But now I'm in a bit of a bind... I need testers to help ensure that my very quickly whipped up pattern is good enough to be put out there. If you consider yourself an experienced beginner and want to test this pattern, I would welcome your involvement. Ideally, I'd like to have this ready to go before mid-January, so I'm looking for people who can turn this project around within the next five weeks. Check out my specific requirements here if you're interested. UPDATE: I have filled my tester positions so will not be needing any more at the moment. Thanks for your interest! Hi Rochelle! I'd like to see if I fulfill your requirements, but don't see where to click to see them. I am spending every spare moment working on a quilt for a Christmas gift right now, but may have time after the new year. Rochelle I can test this, but I do not have a thumb lock closure. If I can make it with a twist turn lock closure or a magnetic snap closure, then I can test it if that works for you? Let me know.